Has any one successfully removed options from the Conflicts window when you modify an object in Creo Parametric that you do not have Checked Out? We set the Creo config option to default "Continue", but we are looking to remove the "Revise and Check out now" option. Users are inadvertently creating new revisions on top of the one that they are supposed to be modifying. Now instead of working on rev B, they are working on rev C without even knowing. Against my recommendations, we have Revise in our standard lifecycle template from the first working state (In Work) to itself. This is one case where the above may apply. We'd also like very much to not allow users to accidentally select Revise and Check Out (remove this option in the UI shown). Would like them to have to specifically select Revise instead. Obviously I don't know your environment, but is there some compelling business need allowing them to revise something that is not "released"? Normally users are allowed to check out objects at "in work" and only revise objects that have been "released". They should not be allowed to revise an "in work" object to the next revision unless it is "released" first. (Again, unless your business needs dictate otherwise.) 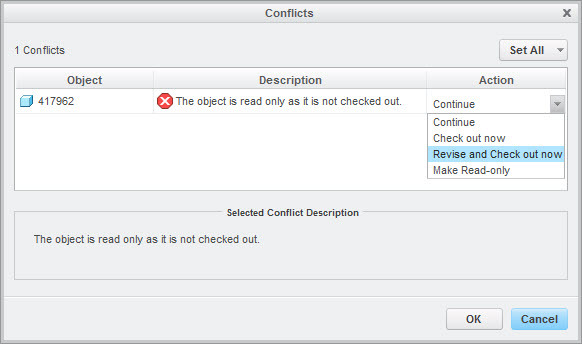 With the system configured this way, the pop-up box won't give the revise option unless the object is already released. For "in-work" objects, the option is just "check out".